Terrestrial and marine late Holocene proxy records from the western and central US suggest that climate between approximately 500 and 1350 a.d. was marked by generally arid conditions with episodes of severe centennial-scale drought, elevated incidence of wild fire, cool sea surface temperatures (SSTs) along the California coast, and dune mobilization in the western plains. This Medieval Climate Anomaly (MCA) was followed by wetter conditions and warming coastal SSTs during the transition into the “Little Ice Age” (LIA). Proxy records from the tropical Pacific Ocean show contemporaneous changes indicating cool central and eastern tropical Pacific SSTs during the MCA, with warmer than modern temperatures in the western equatorial Pacific. This pattern of mid-latitude and tropical climate conditions is consistent with the hypothesis that the dry MCA in the western US resulted (at least in part) from tropically forced changes in winter NH circulation patterns like those associated with modern La Niña episodes. 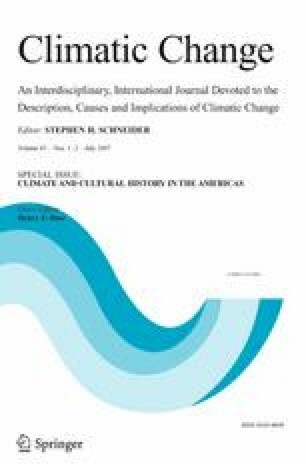 We examine this hypothesis, and present other analyses showing that the imprint of MCA climate change appears in proxy records from widely distributed regions around the planet, and in many cases is consistent with a cool medieval tropical Pacific. One example, explored with numerical model results, is the suggestion of increased westerlies and warmer winter temperatures over northern Europe during medieval times. An analog technique for the combined use of proxy records and model results, Proxy Surrogate Reconstruction (PSR), is introduced. The online version of this article ( http://dx.doi.org/10.1007/s10584-007-9239-2) contains supplementary material, which is available to authorized users.